It certainly is no secret how much I love citrus, lemon in particular, and so this latest cake recipe definitely reflects that addiction. I love lemon so much that I considered doing a week of just lemon recipes to celebrate the blog's 4 year anniversary in June...unfortunately I was just too slammed with other work that I couldn't get it together in time. Stay tuned for next year! I gave this recipe a try when some dear friends of ours were visiting from the UK. I love when they visit, not just because Becks and I have been friends since we were 8 years old, but because I have an excuse to try out new cakes, breads and pastries. Must have tasty snacks to go with our tea while we visit, right? This cake was the perfect after-dinner dessert. 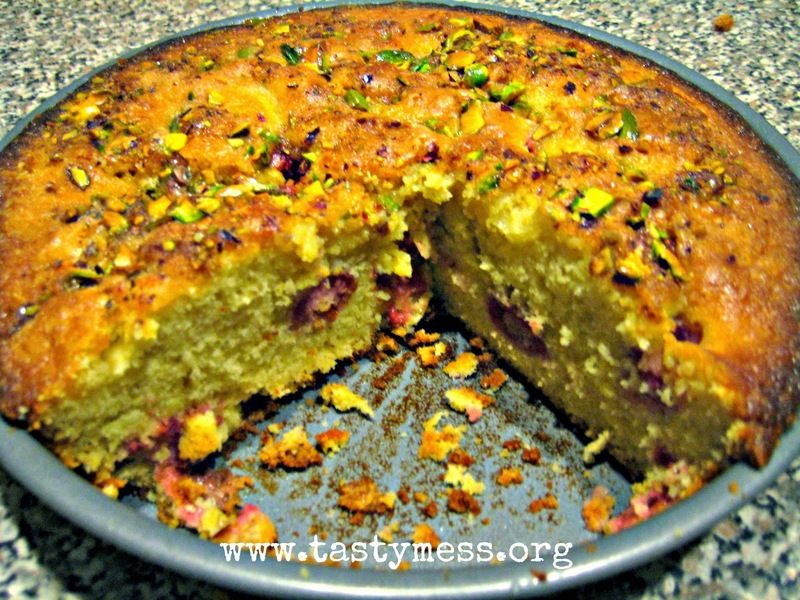 I had never tried an olive oil-based cake and was really surprised by how much I loved it. I'll be hunting down more recipes that feature it in the future, I'm sure. I also got to use local raspberries, so that was a huge end-of-the-summer coup too. The four of us nearly polished off the whole cake in one sitting, so take that as a resounding endorsement and give this cake a try! Preheat the oven to 350. Cut the parchment paper in a round to fit the bottom of a 9" round cake pan. Spray the pan with nonstick spray, then lay the paper in the bottom and spray again. Whisk the flour, baking powder and salt in a bowl and set aside. Combine the eggs and 1 cup of the sugar in the bowl of a stand mixer until light and fluffy (3-5 minutes), then add in the vanilla and 1 tbsp. of the lemon juice. Gradually add in the olive oil with the mixer running, mixing until just combined. Don't over-mix or the cake will be tough! Fold in the lemon zest and flour mixture until just combined. Pour the batter into the prepared pan. Scatter the berries on top of the batter, pressing lightly with your hands to sink them slightly into the batter. Top with the pistachios and 1 tbsp. of sugar. Bake for 40-45 minutes. While the cake bakes, make the lemon syrup. Bring the remaining 1/4 cup sugar and 1/4 cup lemon juice to a boil in a saucepan, stir to completely dissolve the sugar completely and set aside to cool. Transfer the cake (still in the pan) to a wire rack and immediately brush with the lemon syrup (use it all). Let cake cool completely in the pan before removing and serving. Perfect on its own or served with a dollop of soft-whipped cream.